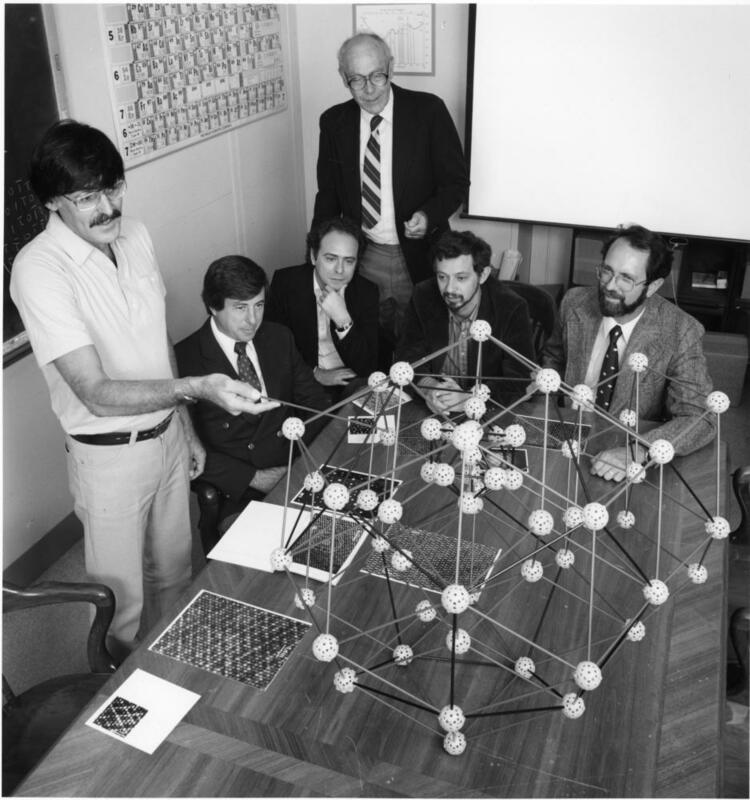 Daniel Shechtman (left) discusses the quasicrystal's structure with collaborators in 1985, just months after shaking the foundations of materials science. Shechtman was awarded the 2011 Nobel Prize for chemistry. "For 200 years, we had a pretty firm idea of what a crystal is," says Paul Steinhardt, a professor of physics at Princeton University. "It is a structure in which there is an atom or a group of atoms that repeats with regular spacing between the repeats." Like floor tiles, Steinhardt says, there are some obvious rules about which geometry works and doesn't work to build a crystal. Squares and hexagons, sure. But try all you want and you'll never make a bathroom floor out of five-pointed stars. Now, turn back the clock to April 8, 1982. An Israeli scientist named Daniel Shechtman was working on a U.S. Defense Department-funded project to search for unusual materials at what was then the National Bureau of Standards, now known as the National Institute of Standards and Technology, near Washington, D.C. His electron microscope seemingly revealed a crystal built out of one of those impossible shapes. "And I counted, and there were 10 spots. And I said, 'No, cannot be!' And I counted the other way — 10 spots. This cannot be!" Shechtman recalls. Shechtman tells the story in an interview posted on the Web by the Technion - Israel Institute of Technology. These days Shechtman splits his time between there and Iowa State University. He was convinced he was on to something big, but he says most people thought he'd simply made a huge blunder — including his lab chief back in Israel. "That person expelled me from his group," Shechtman says. "He said, 'You are a disgrace to our group, and I cannot bear this disgrace.' And he asked me to leave the group. So I left the group. And he was a good friend of mine." For two years, Shechtman fought to prove it wasn't a mistake. But he couldn't get his findings published until finally he teamed up with some respected colleagues. At that point, a physics journal rushed it into print. "Then hell broke loose, because it did interest the community, and many scientists from around the world started to work on these materials," Shechtman says. "And they called me from around the world: 'I have it, I have it, I have it, too!' "
His co-author, John Cahn from the Bureau of Standards lab, was part of that big rush. "I dropped whatever else I was working on, and for the next five years, that's all I worked on," Cahn says. Cahn says they saw 300 papers over the next year from people around the world. About the only place this research wasn't hot was the United States, because the grand old man of chemistry, Linus Pauling, thought it was nonsense and he discouraged anyone from looking into it. Though Shechtman hadn't really figured out how to make the crystal equivalent of a floor of star-shaped tiles, he did discover another way to make a crystal. It didn't have that completely regular pattern you find in diamonds, but its elements repeated in a more subtle way. And this brings us back to Steinhardt at Princeton. Back in 1984, he had been calculating unusual ways that atoms could pack together to form crystals, and at just that time, someone brought him the Shechtman paper with its bewildering pattern of atoms. "Sitting on my desk was the pattern we had computed, and the two agreed beautifully. So it was a very exciting moment," Steinhardt says. Steinhardt coined the term quasicrystal to describe this pattern. These man-made crystals have strange properties, like unusual hardness and slipperiness, so they can be used in shavers and certain nonstick frying pans. Steinhardt expects this is just the beginning, since they have other properties, such as the ability to turn heat into electricity. And nearly 30 years after Shechtman's Nobel Prize-winning aha moment, the field is still in its infancy. If your face or a face you love was shaved this morning with one of those thin-foil electric shavers, it probably brushed up against a strange form of matter called a quasicrystal. And the man who discovered quasicrystals, Danny Shechtman, will get this year's Nobel Prize for chemistry. It didn't come easily, as NPR's Richard Harris reports. RICHARD HARRIS, BYLINE: Crystals like diamonds and quartz hold their sparkly allure because of the way the atoms inside those rocks line up so neatly. PROFESSOR PAUL STEINHARDT: For, you know, 200 years we had a pretty firm idea of what a crystal is. It is a structure in which there's an atom or a group of atoms that repeats, with regular spacing between the repeat. HARRIS: Paul Steinhardt, at Princeton University, says like floor tiles, there are some obvious rules about what geometry works and doesn't work to build a crystal. Squares and hexagons, sure. But try all you want and you'll never make a bathroom floor or a crystal out of five-pointed stars. Now, with that as background, let's turn back the clock to April 8th, 1982. An Israeli scientist named Danny Shechtman was working at the National Bureau of Standards near Washington, D.C. His electron microscope revealed a pattern of dots that seemed to suggest he was looking at a crystal built out of one of those impossible shapes. PROFESSOR DANNY SHECHTMAN: And I counted. There were 10 spots. And I said no, cannot be. And I count the other way - 10 spots. This cannot be. HARRIS: Shechtman tells the story in an interview posted on the Web by the Technion Israel Institute of Technology. These days, he splits his time between there and the University of Iowa. Shechtman was convinced he was onto something big. He'd found a crystal that seemed to violate all the rules, so he thought he was looking at a new form of matter. But most people thought he'd simply made a huge blunder, including his lab chief back in Israel. SHECHTMAN: That person expelled me from his group. He said, you are a disgrace to our group, I cannot bear this disgrace. And he asked me to leave the group. So I left the group. And he was a good friend of mine. HARRIS: For two years, Shechtman fought to prove it wasn't a mistake. But he couldn't get his findings published until finally, two years later, he teamed up with some respected colleagues. At that point, a physics journal rushed it into print. SHECHTMAN: Then hell broke loose because it did interest the community. And many scientists around the world started to work on these materials. And they called me from around the world: I have it, I have it; I have it, too. HARRIS: His co-author, John Cahn from the Bureau of Standards lab, was part of that big rush. DR. JOHN CAHN: I dropped whatever else I was doing. And for the next five years, that's all I worked on. HARRIS: Cahn says they saw 300 papers over the next year from people around the world. About the only place this research wasn't hot was the United States, because the grand old man of chemistry, Linus Pauling, thought it was nonsense and he discouraged anyone from looking into it. Now, Shechtman had not really figured out how to make the crystal equivalent of a floor of star-shaped tiles. But he had discovered another way to make a crystal. It didn't have that completely regular pattern you find in diamonds, but its elements repeated in a more subtle way. And this brings us back to Paul Steinhardt at Princeton. Back in 1984, he had been calculating unusual ways that atoms could pack together to form crystals. And just at that time, someone brought him the Shechtman paper with its bewildering pattern of atoms. STEINHARDT: Sitting on my desk was the pattern we had computed, and the two agreed beautifully. So it was a very exciting moment. HARRIS: Steinhardt coined the term quasicrystal to describe this pattern. These manmade crystals have strange properties, like unusual hardness and slipperiness, so they can be used in shavers and certain non-stick frying pans. Steinhardt expects this is just the beginning, since they have other properties, such as the ability to turn heat into electricity. Nearly 30 years after Danny Shechtman's Nobel-Prize-winning aha-moment, the field is still in its infancy.